Fill in your details below and we will let you know within 24 hours if we can get D&D Waterdeep: Dungeon of the Mad Mage Standard Ed to you with haste! Continuing in the vein of grand adventures such as Castle Ravenloft, The Legend of Drizzt, Wrath of Ashardalon, and Temple of Elemental Evil, the brand new Waterdeep: Dungeon of the Mad Mage Adventure System Board Game features multiple scenarios, challenging quests, and game play designed for a single player or a cooperative group of 2?5 players. 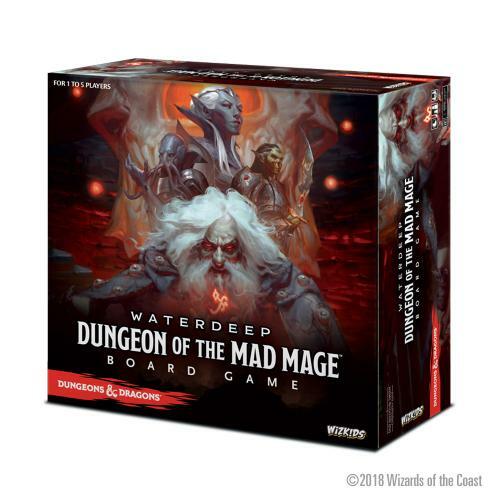 The Waterdeep: Dungeon of the Mad Mage Adventure System Board Game also features new Environment and Bane/Boon cards, as well as the Trap and Spell decks that premiered in Tomb of Annihilation, for even more exciting game-play content! And, beginning with this release, players can now get to level 4 with their characters and gain even more powers! In the city of Waterdeep rests a tavern called the Yawning Portal, named after the gaping pit in its common room. At the bottom of this crumbling shaft is a labyrinthine dungeon known as Undermountain, domain of the mad wizard Halaster Blackcloak, who has seeded his lair with monsters, traps, and mysteries.